Weight gain is the sum of little things that add up over time-choosing the escalator instead of the stairs, eating two helpings of dinner -and so on, and so on. Ever wonder why you're winded or your joints ache-and blame it on your age? Well, think about your weight. Imagine carrying a 10-pound bag everywhere you go. Just 10 pounds adds more than 30 pounds of force to your knees. So those "'achy knees" might mean you need better habits. By realizing you're overweight and by taking control now, you may lower the risk of developing serious health problems, like heart disease, high blood pressure, type 2 diabetes, gallstones and some cancers. Losing just 5% of your body weight may also decrease the stress you're putting on your body. That means doing more of the things you enjoy, without the aches and pains. It's the little things that make up the weight gain, and it's the little things that will help take it back off. Wouldn't you like to drop the weight and stop picking up more? Your weight may be affecting you more than you may think. Lowering your risk for developing gallstones and fatty liver disease. Losing weight can improve your lifestyle. Setting goals and making small changes to your lifestyle to balance the calories you consume through healthy eating with those you use in physical activity is an effective way to manage your weight. Losing even a few pounds can make a big difference to your health now and later. Slow and steady weight loss of one-half to two pounds per week, and not more than three pounds per week, is the safest way to lose weight. This easy-to-use BMI Calculator will help you to better understand your overweight and obesity-related health risks. Wouldn't you like to drop that extra weight and stop picking up more? Take the first step by making a plan to begin shedding those extra pounds. Eating right is an important part of a healthy lifestyle. Learn how to reduce calories, control your portions, and plan nutritious, balanced meals that can give you the energy you need to do the things you love most. Staying active is a great way to improve your lifestyle. Even making small changes to your routine like incorporating 30 minutes of moderate physical activity at least 5 days a week can have a big impact on your health. Learn how physical activity can help to improve your physical fitness, balance, and ability to do everyday activities. Ganar algunas libras cada a�o le puede afectar m�s de lo que pueda pensar. El peso extra le puede causar dolor en las articulaciones y puede resultar en enfermedades cr�nicas como las enfermedades del coraz�n, diabetes tipo 2, o un derrame cerebral. Pero, si es una persona con sobrepeso u obesa, perder tan s�lo unas cuantas libras puede mejorar su calidad de vida a corto plazo y reducir el riesgo de tener enfermedades cr�nicas serias con el tiempo. Esta calculadora de �ndice de masa corporal (BMI, por sus siglas en ingl�s) le ayudar� a entender mejor los riesgos para la salud asociados con su sobrepeso u obesidad. 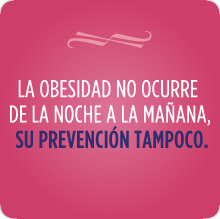 Comer saludablemente le puede dar m�s energ�a para hacer las cosas que m�s le gusten. Aprenda c�mo puede encontrar un equilibrio entre las calor�as que consume y las que gasta para controlar mejor su peso. Aqu� encontrar� algunas recetas saludables para comenzar. �Le gustar�a bajar de peso en lugar de ganarlo? D� el primer paso y haga un plan para comenzar a bajar esas libras de m�s. Mantenerse activo es una buena manera de mejorar su estilo de vida. Incluso, hacer cambios peque�os a su rutina, como incorporar 30 minutos de actividad f�sica moderada casi todos los d�as, puede tener una gran influencia o podr�a hacer una gran diferencia en su peso y en su salud. Aprenda c�mo el hacer ejercicios puede mejorar su estado f�sico, equilibrio, y capacidad de hacer actividades cotidianas. SPOKESPERSON: Think 10 or 20 pounds of extra weight isn't much? We went to a park, and we handed people 10- and 20-pound sandbags. Here's what happened. WOMAN 1: I just truly feel winded. WOMAN 2: I can feel it in my back. WOMAN 3: I didn't realize what extra weight on the body feels like. WOMAN 4: Oh, I definitely felt it in my knees. MAN 1: You can easily put two, three, four, five pounds on in a year. WOMAN 4: Ten pounds makes a big difference. SPOKESPERSON: No one liked carrying the extra weight, but people do it all the time. Wouldn't you like to drop that weight and stop picking up more? MAN 1: I think this is a life changer for me. LOCUTOR: �Piensas que cargar 10 � 20 libras de peso extra no es mucho? Fuimos a un parque y repartimos bolsas de arena de 10 y 20 libras a la gente. MUJER 1: Ahora ya entiendo por qu� la gente pesada no puede caminar mucho. MUJER 2: Porque la rodilla...lo siente uno. MUJER 3: As� como van los a�os, es muy f�cil subir de peso. HOMBRE 1: No quiero este peso para m�. LOCUTOR: A nadie le gust� cargar el peso extra. Pero la gente lo hace todo el tiempo. �No te gustar�a librarte de ese peso y dejar de ganar m�s? When it comes to aiming for a healthy weight, portion size also matters. Do you know the correct portion sizes? Take the Portion Distortion Challenge.